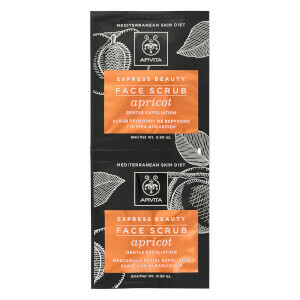 Treat your complexion to APIVITA Express Brightening Face Scrub - Bilberry; a radiance-renewing formula enriched with the antioxidant-rich superfood. Utilising Jojoba and Almond grains, the luxurious treatment gently buffs away dead, dull skin, whilst Honey and Olive Oil restore softness and moisture. Lack-lustre skin appears luminous and healthy with a natural glow. 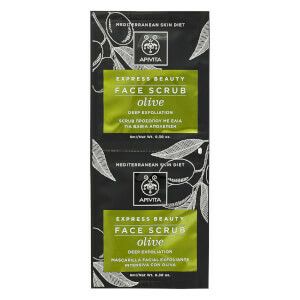 Apply a rich layer on clean skin avoiding the eye area. Leave on for 10 minutes, remove the excess mask with a damp cotton pad and then rinse off well with water. Use 1-2 times per week. Aqua** (Water**), Caprylic/Capric Triglyceride, C12-13 Alkyl Lactate, Jojoba Esters, Stearyl Alcohol, Glyceryl Stearate, Aqua (Water), Prunus Amygdalus Dulcis (Sweet Almond) Oil, Potato Starch Modified, PEG-100 Stearate, Magnesium Aluminum Silicate, Olea Europaea (Olive) Fruit Oil*, Triheptanoin, Cetyl Esters, Vaccinium Myrtillus Fruit Extract, Mel* (Honey*) Extract, Sideritis Perfoliata Flowers/Leaves/Stems* Extract, Sideritis Scardica Flowers/Leaves/Stems* Extract, Sideritis Raeseri Flowers/Leaves/Stems* Extract, Saccharum Officinarum (Sugar Cane) Extract, Prunus Amygdalus Dulcis (Sweet Almond) Shell Powder, Piper Nigrum (Black Pepper) Fruit Oil, Citrus Aurantium Dulcis (Orange) Peel Oil*, Helianthus Annuus (Sunflower) Seed Oil*, Lavandula Angustifolia (Lavender) Oil*, Citrus Limon (Lemon) Peel Oil*, Panthenol, Citrus Limon (Lemon) Fruit Extract, Citrus Aurantium Dulcis (Orange) Fruit Extract, Acer Saccharum (Sugar Maple) Extract, Arginine, Tocopherol, PEG-60 Almond Glycerides, Glycerin, Hydroxyethylcellulose, Potassium Sorbate, Sodium Phytate, Citronellyl Methylcrotonate, Alcohol, Phenoxyethanol, Benzyl Alcohol, Parfum (Fragrance), Benzyl Salicylate, Citronellol, Geraniol, Limonene.